Sherry FitzGerald is offering No 2 Roscam Park, Roscam, Galway, to the market for sale by private treaty. This is a wonderful detached four bedroom bungalow on a prime c0.14ha (c0.35 acre ) landscaped site in a very popular location. The property has been lovingly maintained and is presented in excellent decorative order throughout. Roscam Park is an excellent development of only 12 detached homes on private mature sites. Local shops, medical practice, dental surgery, pharmacy, and hairdressers are within walking distance, as is the bus stop for easy access to the city centre. The property is just located off the Coast Road to Oranmore with excellent shops and services available along with Renville Park and scenic seaside walkways. Galway Clinic, Parkmore and Briarhill industrial estates, and access to M6 and M18 motorways are within a few minutes' drive. This home was constructed in 1980, with conservatory extension and a number of other improvements and renovations carried out over the years, including recently upgraded insulation and a new oil boiler. Size is 193sq m (2,077sq ft ) approximately. Accommodation comprises living room, dining room, kitchen/dining/living area, conservatory, four bedrooms with master en suite, bathroom, and guest wc. The BER is C3 on BER cert no 101132389, with an energy performance indicator of 213.17kWh/sq m/yr. The gardens are mature and landscaped throughout with lawns to front and rear and flower beds, trees, and plants throughout. The property benefits from tarmac drive, Liscannor stone pathways, detached garage, and boiler house to the rear. Asking price is €520,000. This is a lovely family home in an excellent location and viewing is strongly recommended. 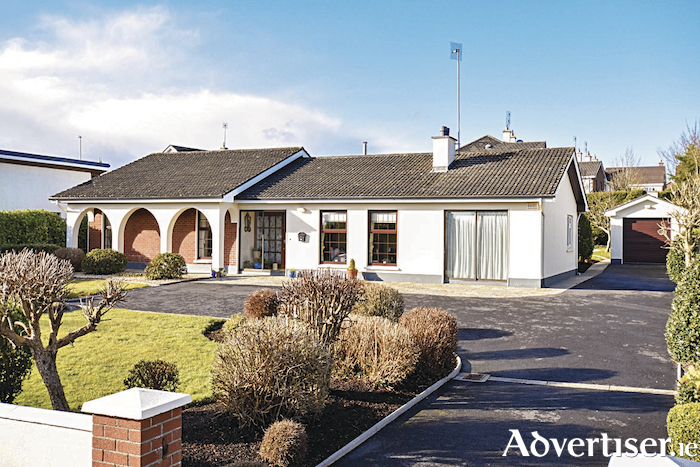 Viewing is strictly by appointment with John Clohessy, Sherry FitzGerald, One Galway Central, Forster Street, Galway, 091 569 123/087 973 9967 or email [email protected].